How do you find that right pattern after you have the fabric? Thread: How do you find that right pattern after you have the fabric? Three years ago I purchased a collection of seven coordinated fabrics to make a queen size quilt for our bed. I love the fabric, but I have yet to come across the perfect pattern! By perfect, I mean that I really want to use all seven fabrics. I have seen many patterns that I like, but they call for just three fabrics, four, or five. Or maybe ten! 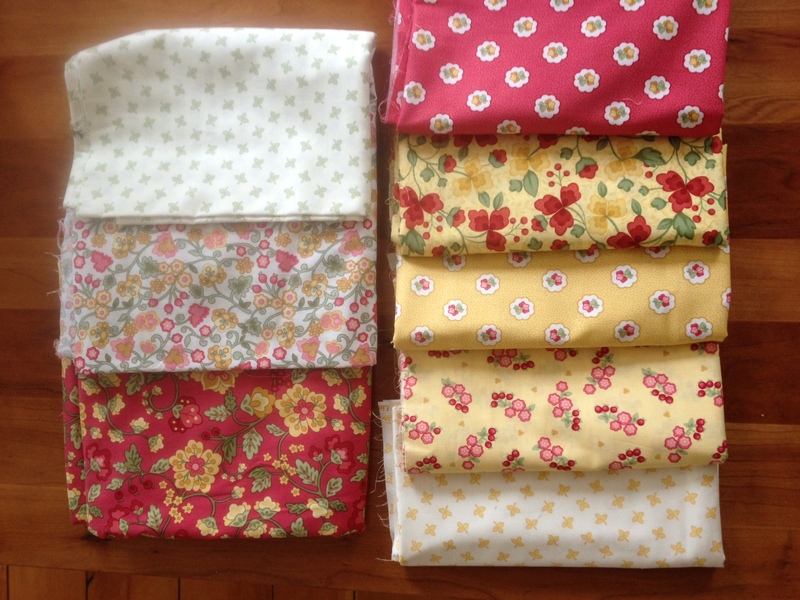 I have over five yards each of three of the fabrics, and a yard each of the remaining four fabrics. That has to make something, right? I am at a loss. I want to avoid that scrappy quilt look, since that's what I tend to make. I wish I could find a site where I could type in the number of fabrics I have and patterns would pop up that match! Have you ever considered a Bargello. Some patterns only require 10 fabric but you could possible repeat the pattern a bit more. Sorry, that is all I could think of off hand. HOPE you find the perfect pattern !! I have attached a picture of my fabric. I think I have, anyway! The three on the left I have plenty of ... the four on the right I have one yard of. I agree, it is so much easier to choose the pattern first. But I really liked this fabric and was SURE I would have no trouble picking out a pattern. Ha. ManiacQuilter: I just took a look at some Bargello patterns, but I tend to be more of a traditionalist. But they are pretty! I can't even count right. No wonder I can't find a pattern. I have eight fabrics, not seven. It would make a beautiful blooming nine patch. if you were going to toss a solid into the mixture - what would it be? the red or the yellow or maybe the white? Those colors are really pretty and they go so well together. I love them too. don't forget some designers of fabric offer patterns too! and i too think it's great fabric. since you've tagged yourself here as a bit more traditional - what if you did something like a 12 block sampler with traditional blocks - Jacob's Ladder, friend's star, grandmother's puzzle, etc.? i think these fabrics would be beautiful in that setting. WTxRed: I would probably throw in white. (unless someone suggested I do otherwise! The blooming nine patch is a good idea. A friend had also suggested the disappearing nine patch. But I would need nine fabrics. I guess if I got a solid, that could be my 9th. A friend had also suggested the disappearing nine patch. But I would need nine fabrics. I guess if I got a solid, that could be my 9th. I've done D9P without 9 fabrics. I think it would make a nice sampler. Funny! I really like your fabrics. I don't seem to have any suggestions for your pattern, but your fabric is just beautiful!! How about the disappearing 9-patch. I made that with many fabrics and it came out awesome. I did make the center square (which is cut into 4s) the same color. Even though my niece picked out the colors (which I did not like), colors of the sunset, I ended up loving the quilt. Plus its easy. if you reorganize them, you only have three colors - put white backgrounds together for light, both red backgrounds for darks and other four together for mediums....having only three colors may make it easier to find a pattern. I think I would pick a couple of blocks that I like, which would go well with each other, and then split the fabrics into two groups and use one block for each. I like the Double Slice Layer Cake from MSQC. Unless it's too scrappy. They might have other patterns that would work with your fabric too as they usually work with charms and layer cakes. You just wouldn't have as much variation. Good luck- your fabrics are beautiful and what ever you decide will be too. I would add a solid green - a green that goes with the leaves and vines in the fabrics. It would give you contrast as well. A day or so ago, someone posted a photo of a quilt that they were looking for the pattern for. She said she was working with two young ladies learning to quilt. One of them found the pattern. Don't remember who the poster was, but as soon as I saw your fabric I thought of that post. Perhaps the original poster will pop on here so you could see the picture. Don't think you would need a pattern. I did one that was several colors, don't quite remember how many but it might work well with your fabrics. I got the idea for it from a post on this board. If I remember correctly the name of the design was This Way and That. I'll see if I can find the original post. I had a picture of mine but it was in my phone and its gone. Found the original post by Jennalyn titled something like "If you we're making this how would you do it and why "
Sorry I don't know how to link. She was using 15 fabrics. I did not use that many. You could use however many you want. I would suggest using a consistent light background in both blocks. I used a pale aqua with a light to medium aqua scroll design. That is the fabric that will require more than one yard.